A little while ago, I promised you I'd post White Owl Lacquers first first collection as soon as I'd have a chance and luckily it came in the mail sooner than expected so here we go!!! 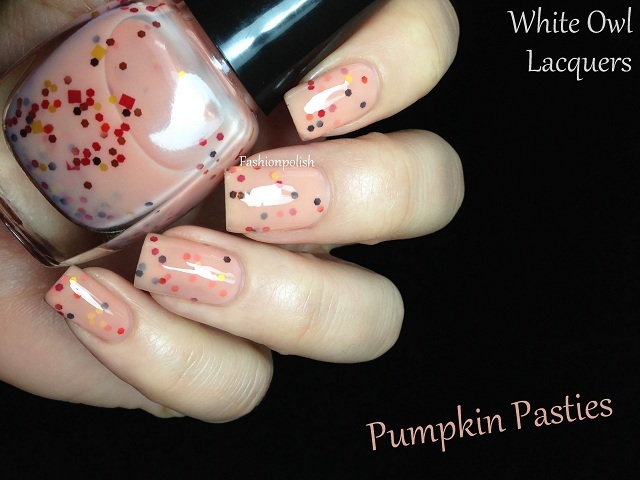 Pumpkin Pasties : 2 coats plus topcoat, no underwear. 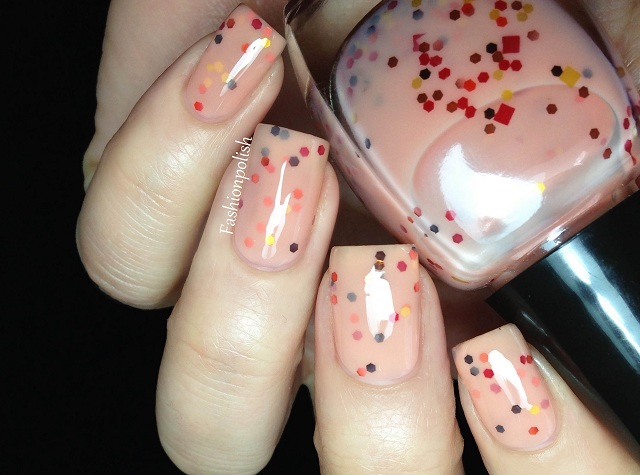 Blend of orange, brown and mustard glitters in various shapes and sizes in a pastel apricot base. I really love how soft and delicate this looks. The glitters are perfectly balanced and match the base color beautifully! 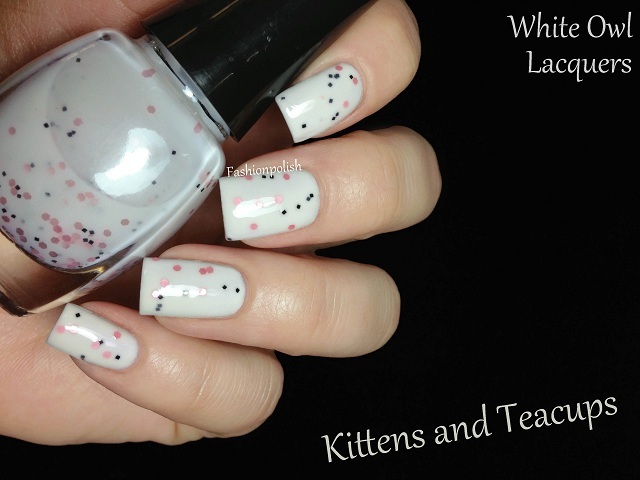 Kittens and Teacups : 2 thin coats over white plus topcoat. The pink and black glitters are less dense and the white base a little sheerer than the previous color, making it a 3 coater. I find the name very fitting, reminds of porcelain somehow. Dwelling On Dreams : 1 coat plus topcoat over China Glaze Kinetic Candy. 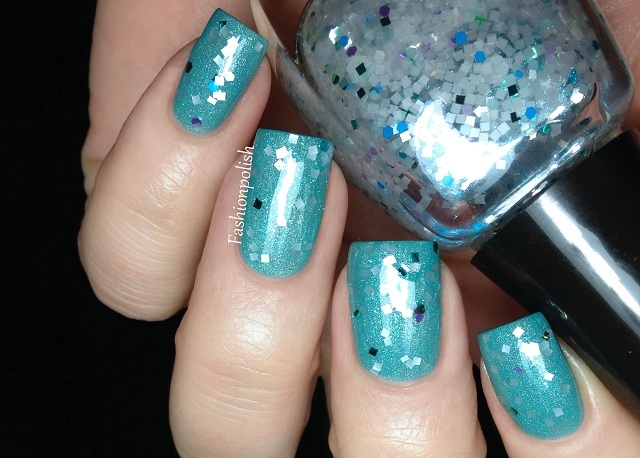 The mix of turquoise and gold glitter is to die for! 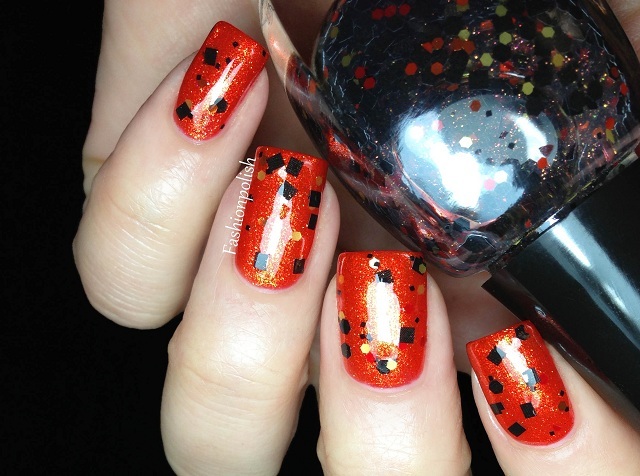 I'm completely in love with this polish... Two coater on its own and very similar to Pumpkin Pasties in terms of opacity. 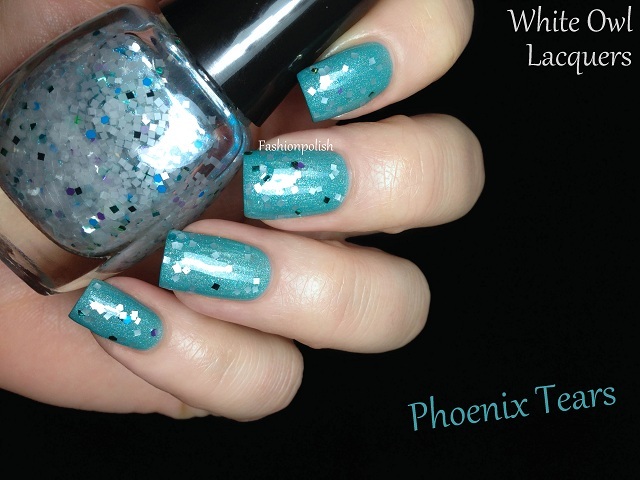 Blend of transluscent white plus various colors of square glitter in a blue shimmer infused clear base, very wintery! 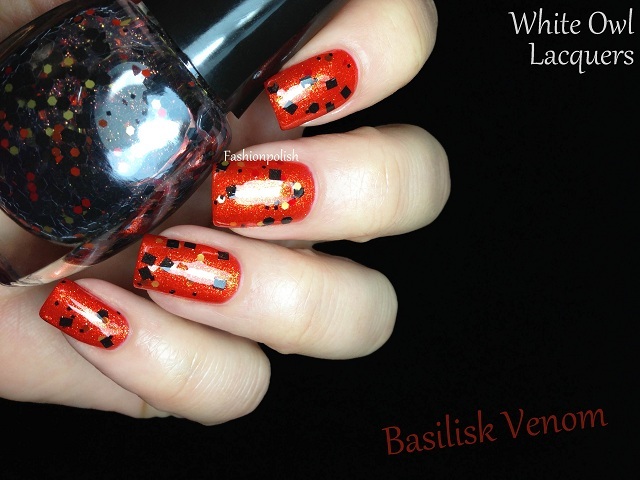 Basilisk Venom : 1 coats plus topccoat over China Glaze Riveting. Mix of differents tones of orange plus gold and black glitter in a clear base with gold shimmer. This glitter is so fierce! It will look amazing on so many colors, LOVE. Moony : 1 coat plus topcoat over Essence I'm the Boss. 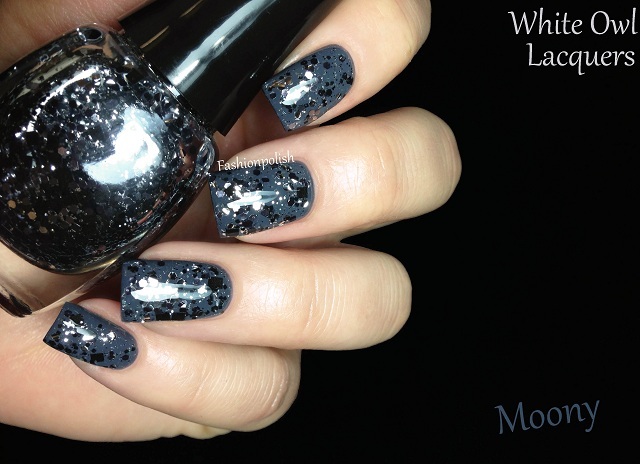 Silver and black glitter in many shapes and sizes in a clear base. I've tried this one over many colors and it was pure love each and every time! For a first collection, I need to say I'm impressed! 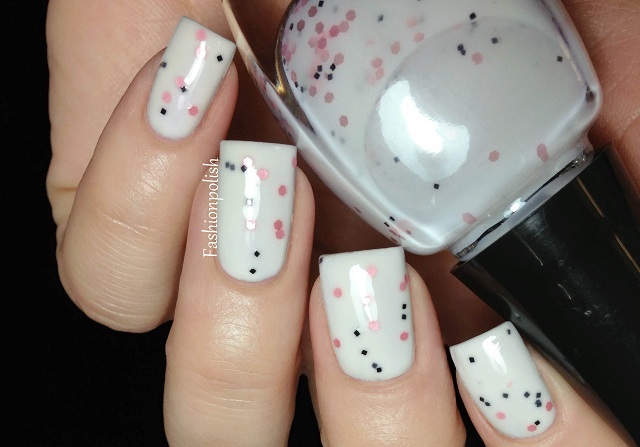 The creator of White Owl Lacquers, Mara, is a friend, fellow blogger and famous pastel lover and I love that she stepped out of her comfort zone to create unique and exciting colors. I couldn't name a favorite! 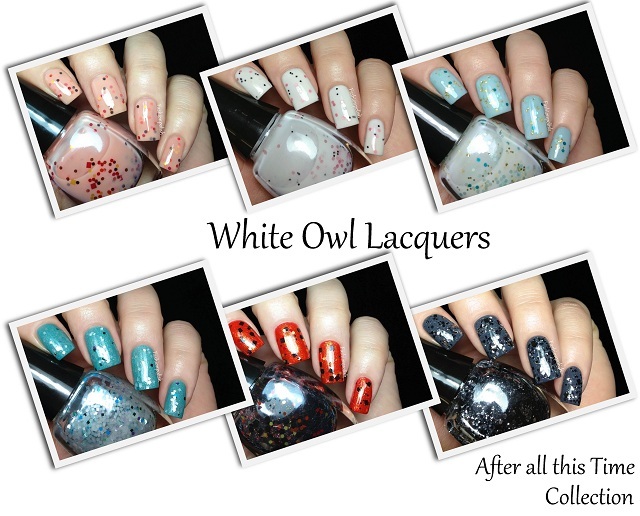 White Owl Lacquers is available on Big Cartel and retails for $9 each (full size) or $27 for the entire collection (minis). The stock is limited so grab yours while you can! I'm so so excited to see my colors in your beautiful nails.... and your amazing swatches, I'm speechless, THANK YOU! Pumpkin Pasties is SO gorgeous, they all are. Sometimes I just want to buy your swatches instead of the polish lol...your swatches are amazing. Really pretty. Love the layering combos. Great choices. The combo´s you did are great but especially the one for Dwelling on Dreams! oh.my.god. even if the polishes weren't as beautiful as they are, i *need* this collection because of its name - my favourite line in the entire series!